Look at this text from the cover. Reading up on the author a bit online, Bodek appears to be a fairly prolific writer. While I have not yet read any of his other books, I appreciate that they all seem to be very different from one another. 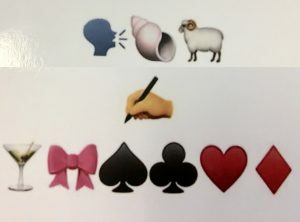 Bodek is no one-trick pony, a fact he reiterates with The Emoji Haggadah, another unique offering. So do I recommend it? That depends on what you intend to use it for! If you are a Haggadah collector, as many people appear to be, then you absolutely need this. Your collection simply will not be complete without it. If you are a puzzle fanatic or a code enthusiast who is also familiar with the basic “plot” of the Haggadah, then you will also have a lot of fun deciphering this book. Honestly, useful at the Seder or not, The Emoji Haggadah has been quite the conversation starter on my desk. I can only imagine that it will have the same effect on your coffee table. 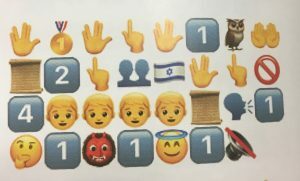 The newest edition of The Emoji Haggadah – the one I haven’t yet seen – is published by KTAV and is available on Amazon. Addendum: Pursuant to my posting this review, the author sent me a copy of the appendices, “How to Read This Book, in 14 Plain Steps” and a glossary of the 20 most common emojis in the Haggadah. From these appendices, we learn such facts as (spoilers! ): there is no emoji for matzah, so Bodek used the universal symbol for “no” plus bread; the number 4 + an evergreen = forever; an emoji used twice means that a word is plural; Yaakov means “heel,” so he’s represented by a shoe emoji; the US flag means “us”; etc. This is like when the cryptogram in the newspaper (remember newspapers?) would give you the first five letters – it’s still a fun puzzle but not quite as frustrating for those of us not at an advanced level.